Even those of us who love correctional nursing know it is a tough specialty. Earlier posts discussed the reasons we need to take care of ourselves, and the issues of secondary traumatization and moral distress. This last post in the Correctional Nurse Self-Care series is about compassion fatigue. Although some sources consider compassion fatigue and secondary traumatization to be similar concepts, they have different root causes. Secondary trauma comes from absorbing the stress of the traumatic experiences of our patients. It is a taking upon ourselves the weight of another’s past and present life experience and feeling the physical, psychological, and emotional results. Compassion fatigue, on the other hand, is the giving of ourselves to others to the point of depletion repetitively without adequate recovery. The combination of secondary trauma, moral distress, and compassion fatigue can be a deadly cocktail for correctional nurses. Self-care intervention is needed to maintain a healthy equilibrium. 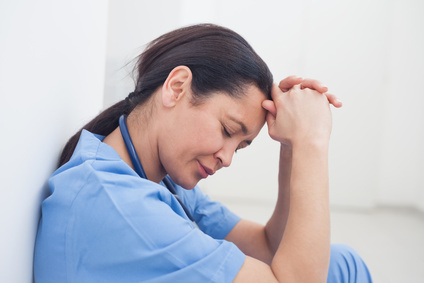 Compassion fatigue results from the chronic use of empathy in nurse-patient relationships. Correctional nurses battle to stay in the zone of helpfulness while not leaning toward over-involvement or under-involvement with the incarcerated patient population. Maintaining a therapeutic relationship can be draining. We are alternately guarding against being drawn into manipulation on one end of the helpfulness continuum while avoiding becoming jaded to patient needs on the other end. The key to minimizing compassion fatigue may be in modulating the two elements of empathy and engagement for optimum functioning. Both are necessary for a meaningful nurse-patient relationship, but in balanced and appropriate doses. Besides the dynamics of the nurse-patient relationship, our environment of care delivery also influences levels of compassion fatigue. The following organizational factors, all prevalent in the correctional health care environment, have been implicated as contributing to compassion fatigue. Self-knowledge. As nurses, we know that “an ounce of prevention is worth a pound of cure” for our patients. Unfortunately, we don’t always apply the principle to our own well-being. Going back to the idea of a self-care plan addressed in an earlier post, a first intervention may be gaining knowledge and self-knowledge about your current state of empathy and engagement with your patients. Take stock of where you are on the helpfulness index. If you find yourself over-involved, you may be headed toward compassion fatigue and need to realign. On the other hand, you may have already over-corrected your empathy and engagement and are now under-involved with your patients in order to protect yourself from further compassion fatigue. Self-care. Basic self-help principles are necessary – even for super nurses! Be sure your schedule includes adequate rest and relaxation. Positive connection with friends and family can help maintain balance. Get some physical exercise. Practice spiritual rituals that are satisfying to you such as prayer, meditation, readings, or service. All of these activities have been found to buffer the effects of compassion fatigue. Sometimes a serious intervention is necessary. This is especially true if you are going through a season of battery overload and spiking need for emotional reserve. There are times when even the standard self-care activities cannot keep up. Fellow nurse, Elizabeth Scala, over at Nursing from Within, is running an Art of Nursing program in May that can help recharge your correctional nurse battery. How do you manage compassion fatigue? Share your tips with our readers using the comments section of this post. ← Correctional Nurse Self-Care: Are You Carrying the Heavy Burden of Moral Distress?